What is "Trolling" Your Reader? 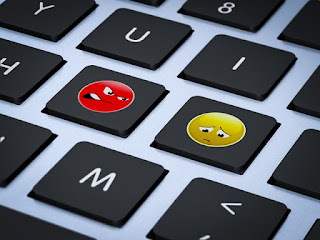 Internet users across the globe have popularized the idea of trolling, posting negative commentary online (especially on social media platforms) to purposely upsets the people reading these posts. Internet trolls write offensive and hurtful comments to rouse a reaction from readers interacting with a troll's post. Trolls abandon social norms and seek to harm whoever is willing to read their commentary. A more mild version of trolling is known as clickbait. 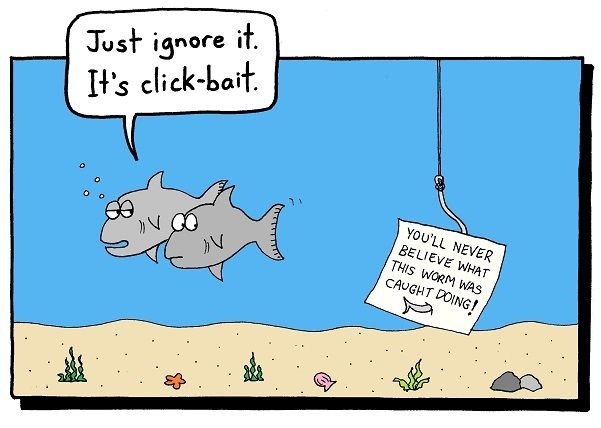 Clickbait is "(on the Internet) content whose main purpose is to attract attention and encourage visitors to click on a link to a particular webpage." It is commonly used among YouTubers. Fans of YouTube often call out content creators for their use of "clickbait." These fans will claim that YouTubers give their videos scandalous titles that have little to do with the video's content or overdramatize the content in the video. This occurs most often in storytime videos, videos in which a YouTuber shares a story about something that happened to them. YouTubers are not the only content creators hungry for hits. Journalists are using this same trend in headlines. While some label their stories as opinion pieces, readers argue that these inappropriate headlines purposely mislead the audience. Journalists often troll their audience by titling stories with headlines which upset the reader. These headlines may increase traffic and general revenue to the story, but, much like clickbait, they are not honest to the article's true intentions. Readers distrust journalists who use clickbait as a device to generate interest. When readers do not trust the sources from which they obtain their news, the overall success of news outlets are compromised. Readers will unsubscribe from news organizations, and it can ultimately lead to news sources shutting down completely. Journalists should operate under several codes of ethics. Many of these codes hold truth and integrity as the most important values for journalists to have. To operate with journalistic integrity, journalists must be truthful and transparent about the information they reveal in their articles. In remaining honest, journalists should not scandalize the content in their stories. Using misleading headlines opposes these moral principles and the ethical codes of journalism. Journalists who use trolling headlines argue that their stories are opinion pieces, and they can therefore exaggerate their opinions. However, by exaggerating the information in the headline, the journalist obstructs the reader's overall outlook of the article (and possibly the publication) before he/she/they can read it in its entirety. Headlines are meant to capture the reader's attention. They are not meant to mislead or offend the reader. Evoking negative responses for the sole purpose of gaining attention is not journalistically ethical. Not only is it harmful to the reputation of the journalist, it is harmful to the reputation of the publication for which the writer works. Writers can draw attention with their headlines in less caustic ways. Headlines with interesting information, a witty or catchy tagline, or a quote can interest readers without offending them. Clickbait is a tactless and costly way to up the views on a news story, and it compromises the validity of the piece itself.